Anxiety is, in essence, a form of the body’s response to stress, otherwise known as the fight-or-flight response. Ancestors of modern humans, when hunting or escaping from predators, benefitted from the energy boost and heightened awareness associated with this fight-or-flight response. However, in modern humans, this response is a reaction to everyday stressors, such as an upcoming exam or a death in the family, which we can neither fight nor escape from. This pent-up energy is then funneled into symptoms of anxiety. Research has revealed that anxiety is caused by the release of neurotransmitters and hormones as a reaction to an event or situation perceived by the brain as stressful. Some of the biological signaling chemicals involved in anxiety include serotonin, adrenaline, endorphins, and dopamine. The physical manifestations of anxiety may include elevated heart rate, nausea, dizziness, perspiration, and a numb or tingling sensation in the extremities. In some individuals, an abnormality in the balance of brain biochemistry leads to excessive, constant, and unrelenting anxiety. These are known as anxiety disorders. They are actually quite common — the most common mental disorder — affecting around 44 million Americans. Individuals suffering from anxiety disorders experience irrational fears about everyday stressors or circumstances to the extent that it severely impacts their quality of life. Some examples of anxiety disorders include general anxiety disorder, social anxiety disorder, separation anxiety disorder, panic disorders, and phobias. Anxiety disorders also have a high co-occurrence rate with depression. Risk factors for anxiety disorders are still being studied and are not yet entirely understood. However, mental health care professionals do know that they are a complex result of interactions between genetic (such as family history) and circumstantial factors. In other words, those with family members who suffer from anxiety disorders have a higher risk of developing a similar condition. Additionally, the symptoms of these disorders may be initially triggered by a stressful life event. What’s the relationship between cannabis and anxiety? 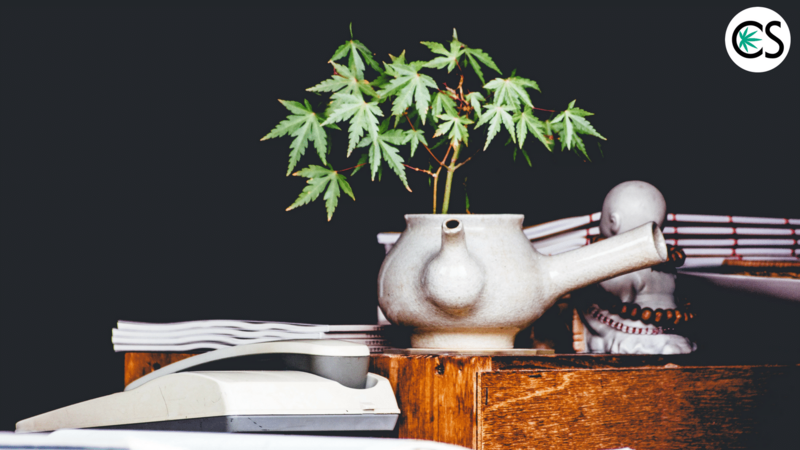 Although widely discussed, the relationship between cannabis and anxiety is poorly understood. Many individuals who have smoked pot can testify to its calming effect. Usually, that’s the goal. Whether you’re plagued by a financial concern or worried about a high-stakes job interview, a “good high” can mellow out and take the edge off of previously unrelenting stress, even replace it with a sense of relaxation and peace. However, there are also plenty of testimonials of individuals who experienced the possible stress-elevating effects of marijuana. There are countless stories of highs gone wrong in high-stress situations – uncontrollable sweating or fidgeting during job interviews, inability to concentrate during an exam. So, the question is, does marijuana ease or increase a person’s anxiety? The effect of marijuana not only differs from person to person but also depends on the person’s already existing state of mind. Some individuals may have a higher tolerance to the anxiety-elevating effects of cannabis. A person with an existing anxiety condition or disorder, such as the ones listed above, would be more susceptible to experiencing the paranoia and panic associated with a bad high. The experience also varies for each person with each use, depending on his or her current mood and the dose size. However, to have some understanding of the relationship between cannabis and anxiety, it’s important to know the difference between two key compounds in marijuana, otherwise known as cannabinoids: tetrahydrocannabinol (THC) and cannabidiol (CBD). Both of these cannabinoids, THC and CBD, bind to a receptor in the brain named by neuroscience researchers as cannabinoid receptor type 1, or CB1. The CB1 receptor exists on the surface of neuron cells and is very closely tied to the fight-or-flight response and the complex array of neurotransmitters that regulate it. When researchers studied this CB1 receptor, they discovered that when normal neurotransmitters, which exist naturally in the brain in the absence of any marijuana use, bind to CB1, there was a lower tendency of the brain to initiate the fight-or-flight response in reaction to a threat. Cannabinoids mimic these naturally occurring neurotransmitters in physical molecular-level structure, allowing them to bind to CB1. However, the effects of these binding interactions are much more complex. Additionally, despite their structural similarity, the effects of THC and CBD on anxiety differ greatly from one another. Let’s first take a look at THC. This is the psychoactive compound of cannabis. In other words, it’s the compound known as being responsible for inducing the desired “high”. For those looking to use marijuana recreationally, this is the cannabinoid of interest. However, THC has been shown to have what is known as a bi-phasic dosage effect. In small doses, users experience that pleasant mellow. Too much, especially for first-time or infrequent users, and it can bring on cannabis-induced anxiety. Regular users can build up a tolerance and raise their threshold of the line between pleasure and panic. However, the threshold does exist, and additional ingestion of THC does eventually bring on the paranoia. CBD is a non-psychoactive compound and is instead typically of interest to medical marijuana users. This component is known to be beneficial in treating conditions such as chronic pain, anxiety disorders, depression, and epilepsy. The key takeaway here is that CBD can actually counteract the anxiety-inducing effects of large larger doses of THC. Previously, strains of marijuana that were high in THC were more desirable for those looking for a quicker high. However, in recent years, because of a greater understanding about the neurological effect of THC and CBD, strains higher in CBD, and especially CBD oil, are becoming more popular. High-CBD strains grant the user more control over their experience and are more likely to induce a calm and collected feeling instead of an anxious, intoxicated, high-energy state. If you’re living in a state or country where growing marijuana is legal, you can easily get a supply of marijuana packed with CBD by getting marijuana seeds that are classified as a ‘high-CBD strain’. How else can I avoid cannabis-induced anxiety? Aside from opting for high-CBD strains, there are other steps you can take to prevent cannabis-induced anxiety. If possible, try to plan ahead. Your state of mind and your environment has a substantial effect on your experience. If you’re in a pleasant, relaxed environment, you’re more likely to have a pleasant, relaxed experience. Don’t count on CBD transforming you into Mr. Confident at a nerve-racking job interview. Avoid the edibles. Because of the way it is metabolized, THC can have a much more intense effect when ingested orally. This results in an elevated risk of a high characterized by paranoia and panic. CBD hemp oil with very little or no THC is another great option for many people. By avoiding THC, you are eliminating the cannabinoid most likely to cause anxiety. In fact, many people use CBD hemp oil to help elevate their sense of well-being. Finally, if you have a serious, chronic anxiety disorder, don’t try to self-medicate your condition using cannabis without consulting a mental health care professional. Winston Peki is a marijuana enthusiast and vaporizer expert. Born and raised in Amsterdam, he grew up in a cannabis-friendly climate and learned quickly what a great ally this plant can be. He believes vaping cannabis and cannabis-based products is the easiest, safest and most straightforward alternative to smoking it. He is the Founder of Herbonaut, an informative vaporizer and cannabis-based products site where you can find vaporizer reviews, cannabis growing equipment reviews, and more.